Whilst nowadays there is a plethora of materials and styles to choose from for the fixtures in the bathroom, porcelain toilet basins are still preferred. Even though they are a classic choice, the truth is that they blend very well with most of the decorative themes and styles found in a bathroom. However, the popularity of this material comes from the fact that they are extremely easy to clean, quick and simple to install, resilient and inexpensive compared to the alternative materials. What makes porcelain toilet basins the number one choice for homeowners? One of the advantages of having porcelain bathroom fixtures is that this material does not present imperfections or crevices where the bacteria or dirt can gather. Therefore, the smooth surface of the material requires very little, effortless and fast cleaning. In addition to preventing dirt accumulation, the non-porous surface is ideal for keeping the bathroom free from germs and bacteria. This is perhaps one of the most important features of a material used for toilet manufacturing. Another advantage of this fine group textures is that it does not oxide or corrode over time. Considering that decorative ideas and themes for bathrooms are becoming overwhelming in the home improvement market, you will be glad to know that nowadays porcelain toilet basins come in all shapes, sizes and color to fit perfectly with the style of even the most sophisticated bathroom style. You are only limited by your imagination, and, of course, your budget. 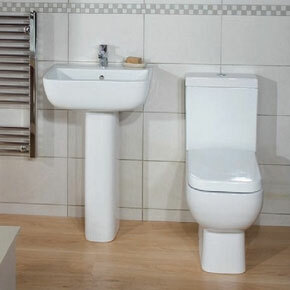 When it comes to choosing the ideal toilet for the bathroom, the rule of ‘no size fits all’ applies. Therefore, the first step in choosing the perfect toilet is to consider the available space in the bathroom. For bathrooms that are very small, homeowners can consider installing a wall hung toilet in a free corner of the bathroom, so as to create more space to move around. On the other hand, if space is not a problem, then the only thing to consider is that that the replacement porcelain toilet basins fit and cover the footprint of the previous toilet. In addition to size, another aspect homeowners need to carefully consider when purchasing porcelain toilet basins is the style. Regardless of whether a person chooses a one-piece or two-piece toilet, he will have access to a variety of colors and shapes of the bowl. Lastly, as water saving is a major concern these days; people should opt for high-efficiency toilets that consume as little as 6 liters per flush. Saving money as well as the planet go hand in hand. Rust causes stains when iron is in extremely high quantities in the water.